All you Greenpointers out there know where this intersection is: Franklin at Calyer Street. In fact, I bet a number of you have walked down this very block hundreds of times without noticing that something is amiss. I know did. That is, until I looked up one day. Your eyes are not deceiving you. 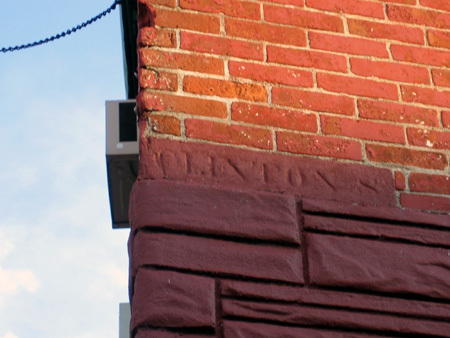 The cornerstone of this house reads “Clinton S(t)”. Pretty neat, isn’t it? Dr. Robert A. Black, the local health officer, with his associates, is trying to stamp out the present outbreak of smallpox in Brooklyn and the physicians of the vaccinating corps have been kept on the jump for over a week. There were five new cases reported at the office on Clinton Street today. The patients were all taken to the Riverside Hospital on North Brother Island . They were Walter Brush, a boy, age not stated, from 275 Driggs Avenue; Helen McMahon, aged 12 years, and Rose McMahon, aged 9 years, from 275 Driggs Avenue; Emma Schwartz, aged 23 years, from 31 Meeker Avenue, and John Devaney, aged 7 years, from 100 Warren Street. The cases from the house at 275 Driggs Avenue are believed to have received the infection from 273 Driggs Avenue, where there was a nest of cases. The previous probably sounds like something from the 17th or 18th century to many of you. It isn’t: this article dates from March 11, 1901. 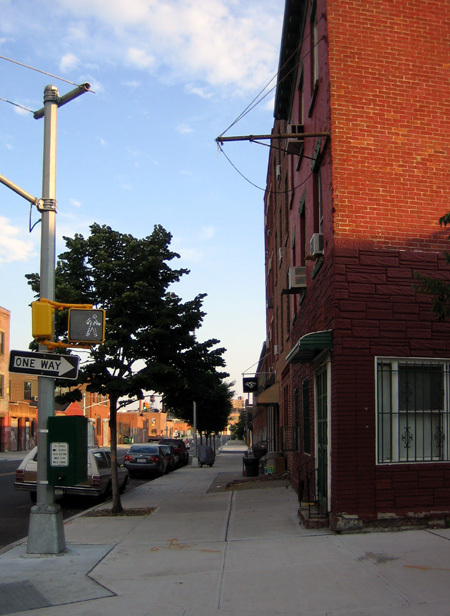 That said, I hardly find it surprising that there was a Clinton Street in Greenpoint. At one time there was both a Washington and Lincoln Street here as well. Naming streets after public officials (especially presidents or in this case, DeWitt Clinton) was a very popular practice in not only Greenpoint, but in Brooklyn as a whole. This practice resulted in a slew of duplicate street names* which took years to unsnarl. It was a long and very contentious process. One which, amusingly enough, often saw “North Brooklyn” (AKA: “The Eastern District”) in opposition to “South Brooklyn” on a number of occasions. Could you imagine trying to get your mail if (for example) there were five Washington Streets extant in the Borough of Kings? ** In addition, if one happened to be a flim-flam man with a sketchy command of Brooklyn geography, all the name changes (that were eventually implemented) would pose a serious problem. Keeping your story straight when you’re being interrogated by the cops is hard enough. 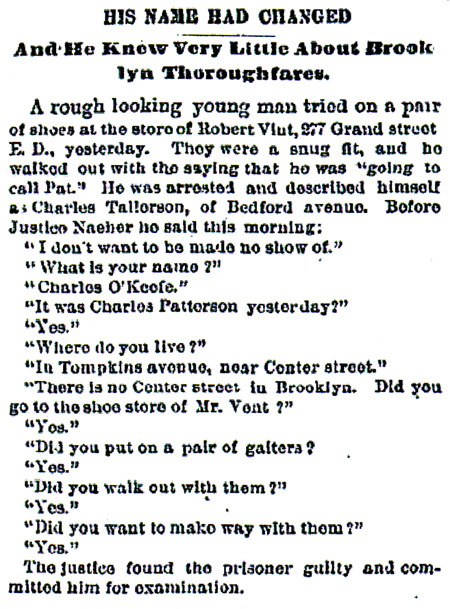 Especially if you have trouble remembering your own name, as I learned from this article in the December 3, 1886 edition of the Brooklyn Daily Eagle. Note to self: If I want to blow someone off, tell them to meet me at Tompkins Avenue at the corner of Center Street. *This list is simply too lengthy for me to feature here. Go to the Brooklyn Public Library’s Brooklyn Daily Eagle online archives, run a search for “duplicate street names” and see for yourself! **This was once the case, by the way. 3 Comments on What is wrong with this picture? I think the streets below Franklin all had different names, because Oak St. is not Oak St. between Franklin and West – i can’t recall the name now but it’s got a nice old brick street name block that is beautiful when the light is right.